Check out the roleplay updates for each week! You will be able to read all the latest additions and fixes to the roleplay system! 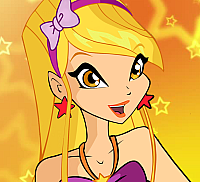 Welcome to the first post of the Roleplay Updates for the official MagicalWinxClub "Winx Club Roleplay"! Today we will be talking about the first additions for the roleplay! Missions - We are planning on releasing a series of missions which your oc's will be able to do. With these missions your oc will be able to earn prizes for their virtual avatar and they will be able to earn a new transformation. These missions will be given to you through npc's (The Winx, Faragonda, Palladium etc.). These missions will sometimes require your oc to either collect a key from an npc, find it themselves, or even create a key themselves. These keys will lead to secret rooms. Secret Rooms - Now let's talk about the secret rooms! When you encounter a secret room you will be stopped by a picture of Aisha telling you, you need a key in order to enter the room. Secret rooms contain traps, underground dungeons, or just rooms with special items. 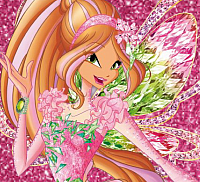 Pixies - Pixies are finally here to the winx club roleplay world! The pixies will be based off of the Winx Club spin-off, PopPixie. Any pixie you create can earn their magic pop. To learn more about the PopPixie world you can head over to the Create-a-Pixie section in the Character Creation forum. That's it for this week! Tune in next week as we announce more of the roleplay goodies! Welcome to the second week of the Roleplay Updates! Today we will be discussing the new money currency for a few of the planets, we'll give you a scoop on the new Christmas Event going on at Alfea, and we'll teach you all about time skips! Time skips - Time skips are easy to follow. Since going according to real life time is hard in the roleplay sometimes we will have to skip a few things. A notice that a time skip has happened will be in red. For example, since going through all of your oc's lessons would take a long time sometimes you'll have to timeskip to lunch or afterschool. Money Currency - So you might be wondering what the actual currency in Magix is. Well, in this roleplay we've decided that we would make the currency "Hearts" and "Diamonds". This is because of the inspiration we got from the Winx Club apps (Winx Fairy School, Butterflix Adventures etc.). Hearts are little stone red hearts that are equivalent to normal money (dollars, euros). The alternative; Diamonds are used to buy rare items for example items for your profile avatar. You will be able to keep track of how much money you have in your oc's profile and you can even get jobs to earn money now! (More on this next week!). So, you may have noticed that right now at Alfea things seem to be getting heated! Well, after a strange incident in the simulation room Professor Palladium tell Headmistress Faragonda that something ghostly is happening. Watch out! I have a feeling that this Christmas at Alfea will be filled with fairytales and untold stories! We're back and ready for a Winx filled new year! There are tons of additions that we've added and are coming your way soon in 2016! Today we'll be mainly focusing on the couple system/dating app coming your way near Valentine's Day, the new student ID cards, and we'll be explaining a new plot! Dating App - We are happy to say that Red Fountain and Cloud Tower are now open which means time for new friends and new love adventures! The Couple System will be an app where your oc can keep up with their boyfriend/girlfriend or just use the app's dating options to find new people to date around your oc's planet! The Couple System app will work for people who also like the same gender! Like we stated above the app will be released in the "Magical Apps" section by Valentine's Day. Student ID Cards - So as most new arrivals to the schools of Magix already know, Student ID's are a thing now! They're not really confusing to use. They just contain simple and basic information about your oc. We had the idea to create these cards so that your oc's could use them like passes to events. For example, let's say your oc and a group of his/her friends are going to a dance club in the city. The club owner will ask you for your oc's ID card. You will have to copy and paste the ID Card to your post in order for the owner to let you in. If you have any questions on this please feel free to pm me (MagicalVanessa). We would also like to thank Jadeavon from Deviantart for creating these ID Templates! 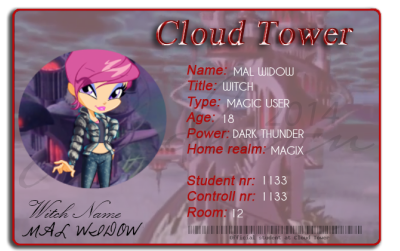 Here's my witch oc's ID Card for example. New Plot 2016! - We're not the only ones ready for the new year, your oc's are ready as well! We have made a huge timeskip from the christmas event and we have jumped forward to the start of the spring semester. 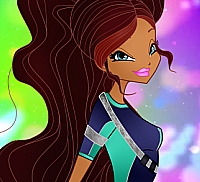 Everyone in Magix is aware of the Legendarium creatures wandering around the planet and everyone is trying to get to the bottom of it, especially The Winx and the professors of all the schools of Magix. It is up to you to see if you can unlock any clues to who is releasing all these creatures from the Legendarium. Hey Guys! Welcome to the 2.1 Roleplay Patch, the patch everyone has been waiting for! In this patch your roleplay fairies will finally be able to earn their Charmix transformation. We will go into further detail on the new transformation system and the new plot. Let's get started! CHARMIX UPDATE - Your fairies can now earn their first transformation: Charmix. In order to earn a Charmix transformation one must do an act of bravery and confidence. The reason why we have put off transformations for the longest time was because we couldn't find a way to portray charmix transformations on the winx avatars but thanks to creativity we have found a way. If you would like to have a specific sub-plot for your fairy to earn their charmix feel free to pm Admin MagicalVanessa. TRANSFORMATION SYSTEM - Speaking of transformations, we would like to introduce you to The Transformation System. There will be an upcoming sub forum in the roleplay section where you will be able to keep track of all of your transformations and your fairy transformation avatars will be stored there! For every transformation that you achieve you will be able to customize the outfits via admins. Just contact an admin and describe to them exactly how you want your fairy's outfit to be. NEW PLOT - For the new plot after the Valentine's Day Dance we were originally going to start the Summertime Arch to align the rp time with the real world but we figured out that with the introduction of the new transformation it would have been a good idea to timeskip to March 2016 Spring instead. The new plot will consist of the Alfea fairies: Talia,Vanessa,Oceane, and Luna going to Cloudtower to try and assist Miss Griffin with a potion to close the Legendarium once and for all. Hey guys, welcome to the renewed 2.0 update. This update is going to make the forum more advanced and more enjoyable for the members! We are going to thoroughly explain transformations,new story plots, and new locations! T R A N S F O R M A T I O N S: Just a remainder that transformations can be seen through the Transformation System in the Roleplay section. There you can view all of your oc's transformations. From now on, transformations will not be revealed to the owner of the oc under any circumstances. In order to see your character's transformation you have to achieve it and then it will appear at the Transformation System in their profile. We will only ask you what you want your oc's charmix to look like through pm but never reveal it. S T O R Y P L O T - From now on we will try and work more professionally with timeskips and jumpcuts. Users will be allowed to create their own storyplot even out of the blue as long as it's not too random. This is to give members more freedom in the roleplay and more say. You will now not be required to wait for a RP Mod (Me) to post that your oc has earned a transformation but you will be able to do it yourself, again, it can't be random. Main Plot - Luna,Vanessa, and Talia venture to Cloud Tower on a mission assigned by Faragonda in the hopes of trying to find ingredients to create a spell that might locate the Legendarium. The quest requires them to assist Headmistress Griffin however the girls come to find that Headmistress Griffin is using the ingredients for her own benefit. Meanwhile, at Alfea Oceane is also on a mission assisting The Winx and Faragonda on small things. We've noticed that we haven't rebooted most of the planets from the old roleplay so we started updating them. So far Solaria is the only one that has been updated. We have added new shops and new locations there, go check them out in the planets section! » Event: The Mai-Multiverse Roleplay February Festival!